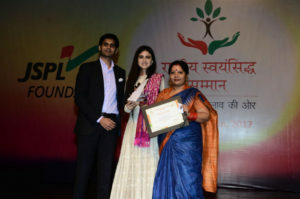 New Delhi: The second edition of Rashtriya Swayamsiddh Samman, a unique initiative by JSPL Foundation to recognize and honour social innovators and Change Agents in India, saw 12 Individuals and 9 Organisations from across sectors receive the prestigious award. At a glittering ceremony held at the Kamani Auditorium on August 03, 2017, the winners were conferred with the title of ‘Swayamsiddh Shri’ andwere given a cash prize of Rs. 1 lakh, along with a certificate of appreciation to acknowledge and support their ongoing work. The awards were given away by the Chief Guest, Shri Chaudhary Birendra Singh, Hon’ble Union Minister of Steel. The Minister applauded the work of JSPL Foundation and the Awardees for their societal contributions. Also present on the occasion were Smt. Savitri Jindal, Chairperson Emeritus, Jindal Steel and Power Limited (JSPL), Shri Naveen Jindal, Chairman, JSPL and Smt. Shallu Jindal, President, JSPL Foundation. 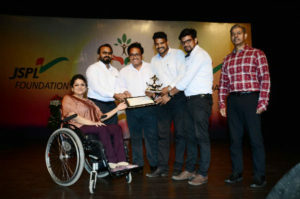 Rashtriya Swayamsiddh Samman is an initiative started by JSPL Foundation to felicitate people for their exemplary Courage, Commitment and Confidence that has enabled them to overcome adversities and create a unique identity of their own, making them a source of inspiration for many in India. 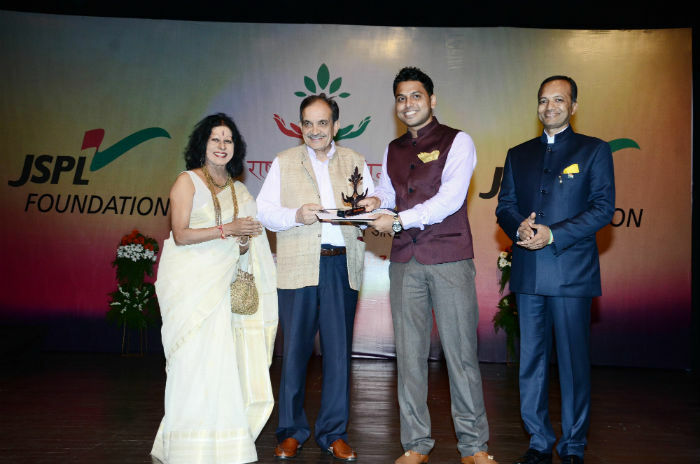 The Foundation has introduced a lifetime achievement award titled – ‘Rashtriya Swayamsiddh Jeevan Samman’ for lifelong contribution in the field of human development. The Award was given to Dr. (Prof) Prasanna Kumar Patasani, Member of Parliament (16th Lok Sabha), Odisha for his contributions in the field of literature, education and spirituality. The stories of the winners in the Individual category are truly inspirational. The special category award of Indomitable Courage, was awarded to Shalini Saraswathi – a quadruple amputee who lost all her limbs owing to a rare bacterial infection; but overcame all adversities of life and emerged a winner. Today she is a writer, motivational speaker and a marathon runner. Some of the other winners include Uddhab Bharali from Assam, a grass-root innovator with a unique distinction of developing more than 85 engineering devices for different purposes in agriculture (Innovation & Technology category); Subhasini Mistry, an extraordinary woman from West Bengal who built a hospital by selling vegetables (Health); S Murugan, an auto driver from Kochi who rescues the poor and homeless from the streets (Public Service category); Akash Chaurasia a young farmer from Madhya Pradesh who has championed multi-layer farming and developed 42 agricultural models all across the country (Agriculture & Rural Development category); Gazi Jallauddin, the taxi driver from West Bengal, who runs two schools and an orphanage, today his school has a strength of 425 students. Winners in the Organisation category include Maaghara Foundation Trust, Odisha working to stop atrocities on women and restore their human rights with dignity; Gramin Samaj Kalyan Vikas Manch, Jharkhand whose TB Care & Control project that has benefited over 12000 individuals till date; Khamir Craft Resource Centre, Gujarat is working with 150 craft units in Kachchh region. Alombro Mayu Yaku Chi Amey Aroga (popularly called AAMYA) from Arunachal Pradesh, has promoted 20 farmer’s clubs to be organised into Producer Organisations for systematic marketing of the agri-horticulture products. 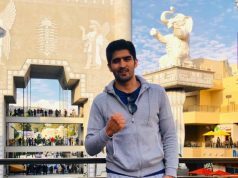 OP Jindal Global University was the Knowledge Partner of the Second Edition of the Rashtriya Swayamsiddh Samman and facilitated the selection process and regional jury evaluations. 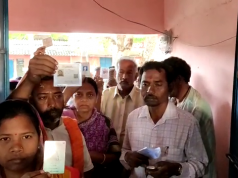 All the entries and nominations were screened and assimilated regionally for further assessment, as per the evaluation parameters metrics to finalise the awardees. The selection process was rigorous with the aim being that only the deserving gets the award. Four regional jury meetings (for South, East, West and North) were held in April 2017 in Chandigarh, Kolkata, Mumbai and Hyderabad respectively to shortlist the entries. The regional juries comprised of prominent people from academia, business enterprises and civil society actively involved in the development sector. And included Padma Bhushan Shri B N Goswamy, Padma Shri Dr Mohammed Abdul Waheed, Padma Shri Dr Aekka Yadagiri Rao, Prof Arun Grover (Vice Chancellor-Punjab University); Dr Huzaifa Khorakiwala (CEO-Wockhardt), Mr Narottam Reddy (President – SBI Foundation) and Prof Shalini Bharat (Deputy Director – Tata Institute of Social Sciences). Mr Ajay Chaturvedi & Dr Srikanta K Panigrahi provided insightful contributions in the evaluation process. The shortlisted entries and nominations were placed before the National Jury that met In July 2017 to finalise the winners. The National Jury comprised of Smt. Savitri Jindal, Chairperson Emeritus, Jindal Steel and Power Limited (JSPL); Smt. Aruna Abhey Oswal, Chairperson, Oswal Group; Ms Shallu Jindal, President, JSPL Foundation; Dr. (Prof) C Raj Kumar, Professor and Vice Chancellor, OP Jindal Global University; Padma Shri Shovana Narayan; Shri Srijan Pal Singh, CEO Kalam Centre; Dr Anurag Agrawal, Principal Scientist-CSIR; & Prof. Ranjan Mohapatra. The awards have been conferred across 11 categories viz. 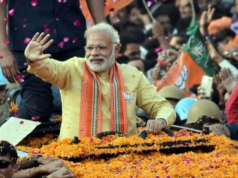 Indomitable Courage; Women Empowerment; Agriculture &Rural Development; Innovation &Technology; Public Service; Health; Education; Sports; Art & Culture; Environment; and Entrepreneurship& Livelihood. 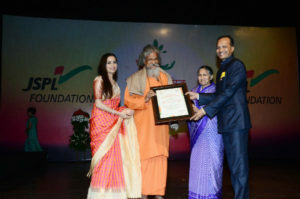 The Swayamsiddh Samman was instituted in 2015 to reward and nurture grass-root change makers and encourage unsung heroes who overcame adversities to create their own unique identity. The first ever Rashtriya Swayamsiddh Samman in 2016 was conferred on 29 individuals and organisations across the country from different walks of life. These awardees today have become Ambassadors of Change and inspiration for many, guiding others to achieve their dreams.